This topic contains 4 replies, has 5 voices, and was last updated by dfinz 3 weeks ago. I had my partner David take these photos of the beautiful flowering tree just behind my hothouse. Its a hot favorite with the butterflies as you can see :). Yes, I think you’re correct, Jacqui – it’s a Houhere (hoheria angustifolia). I found an excellent resource in the T.E.R.R.A.I.N website that shows the very distinctive difference in the leaves. I wasn’t quite sure what was meant by “marble-like blotches” described in the guide book and misidentified based on other factors. The flowering period seems to have been quite short for us and the fruits are now developing, although the “wings” have not yet become “papery”. Consequently there is less butterfly interest in the tree now. 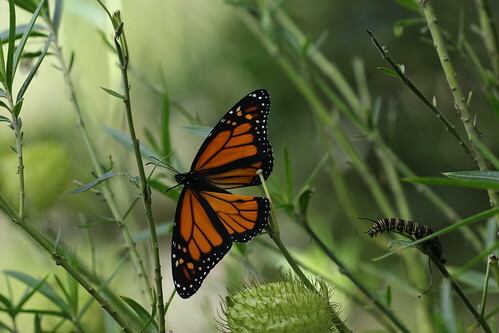 Of course, the butterfly with caterpillar friend are on a swan plant, not the Hoheria. Looks like hoheria or lacebark. Beautiful! Also called ribbonwood. What genus is the tree Leslie? good news to see the monarchs feeding. i have a similar tree in the back garden lacebark/hoheria and have about 12 chrysalis to emerge from the front porch – hope they find it!